Shoot custom backing while crucial production decisions were still being finalized and approved. There was no direct access to offices on the desired floors. Hanging out. Images were shot using a 60-megapixel digital camera from a window washer’s platform, suspended from the roof of a 36-story building, approximately 450 feet in the air. Perspectives shot from the 33rd and 35th floors every hour between 8:30 am and 6 pm. Instant gratification. Using a laptop computer from the building’s rooftop, Pierre Steele assembled a rough-stitch panorama cropped to represent the final backing and emailed it to the client for immediate feedback and direction. Flexibility is everything. 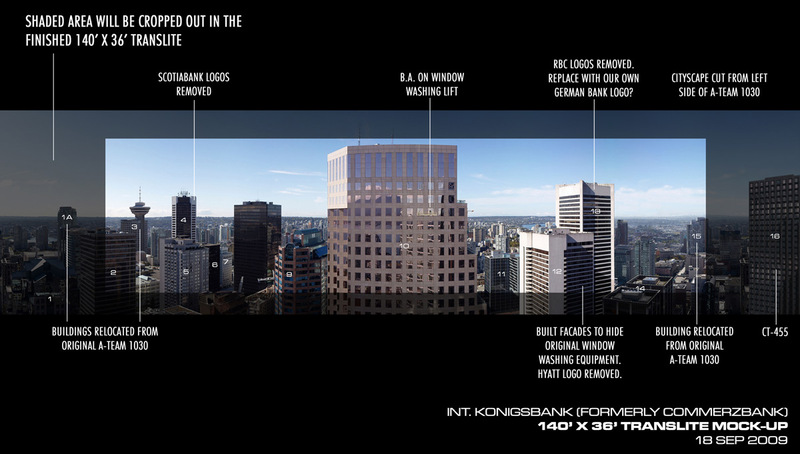 JC Backings created a 180-degree view using 6 pan shots to give the client the greatest flexibility in positioning the backing. Custom means custom. After reviewing the initial stitched image, the client decided that they wanted to reposition the hero building to the center of the backing. 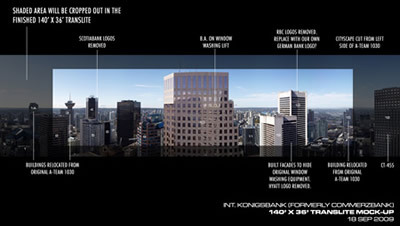 In order to achieve this, JC Backings used imagery from the periphery of the original shot, shifted existing buildings and rebuilt the skyline. Staying sharp. The unparalleled resolution of the 60-megapixel P65+ digital camera allowed JC Backings to crop in to the original image, effectively increasing the scale of all the elements and visually bringing the “hero” building closer. The A-Team project proves why JC Backings is the preferred choice of more production, art and design professionals. Backings Basics: What’s in a name? Back in the day, there was only one type of backing: painted. With today’s digital technologies and advanced photo equipment, there are more options than ever to achieve the look you want for any production you’re working on. Painted backings are hand-painted on muslin using water-based paints. They can be lit for both day and night if opaqued on the back for backlighting. DPC=digital print combination. Day image on front, night image on back. Frontlit for day and backlit for night. DPF=digital print frontlit with either a day or night image, light from the front. DPB=digital print backlit with day or night image, light from the back. Photo backings are printed on backlit FujiTrans film or on frontlit Fujiflex film using a Durst Lambda and a Kreonite processor. Photo backings are also known as Chromatrans, Duratrans or Translite backings. JC Backings uses the letters “CT” or “FL” in front of the backing numbers to denote if it’s printed on backlit or frontlit film. Pierre Steele, JC Backings’ principal photographer, goes wherever clients need to capture the quintessential images necessary to bring a production to life. Here are a few examples of Pierre’s more recent photo shoots. CT-754 and others in the grouping. Contact JC Backings for more information and specific backing numbers. To offer its clients the very best in custom photography, JC Backings recently upgraded their Phase One P45+ digital back to Phase One’s newest flagship product, the P65+. The P65+ offers the world’s first 645 sensor and true wide-angle performance with no distortion. JC Backings was one of the first in North America to use this state-of-the-art digital back. To see backings created with the P65+, click here.